The three galaxies are located in the constellation Leo. M65 lies at a distance of about 35 million light years from Earth and has an apparent magnitude of 10.25. It has the designation NGC 3623 in the New General Catalogue. 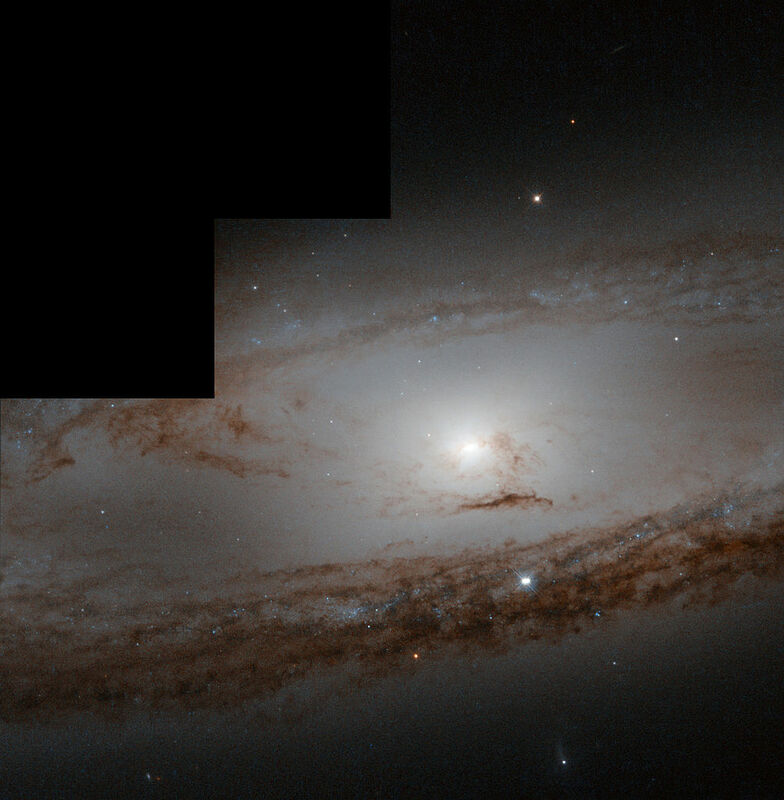 Messier 65 occupies an area of 8.079 by 2.454 arc minutes of apparent sky, which corresponds to a linear diameter of about 90,000 light years. 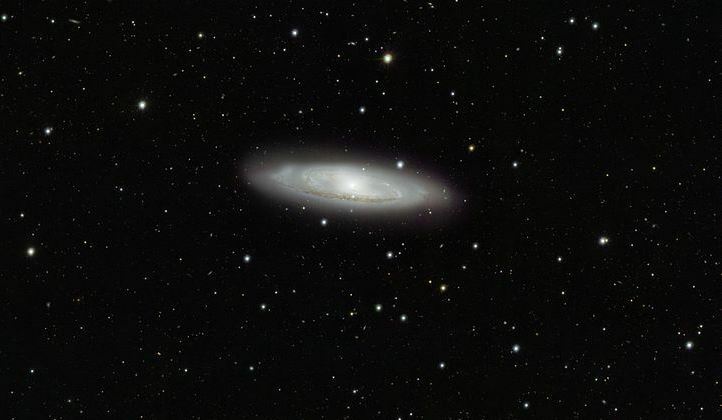 It is one of the most popular targets among amateur astronomers as it can be seen and photographed in the same field of view as its neighbours, M66 and NGC 3628. The galaxy lies in the eastern part of Leo. Thanks to its high surface brightness, it is visible even in small binoculars and appears as an oval shaped patch, along with its bright neighbour M66. Small telescopes begin to reveal the structure of the pair, with a bright central core surrounded by a thin disk of light. To see the third member of the Leo Triplet, however, one needs at least a 6-inch telescope. 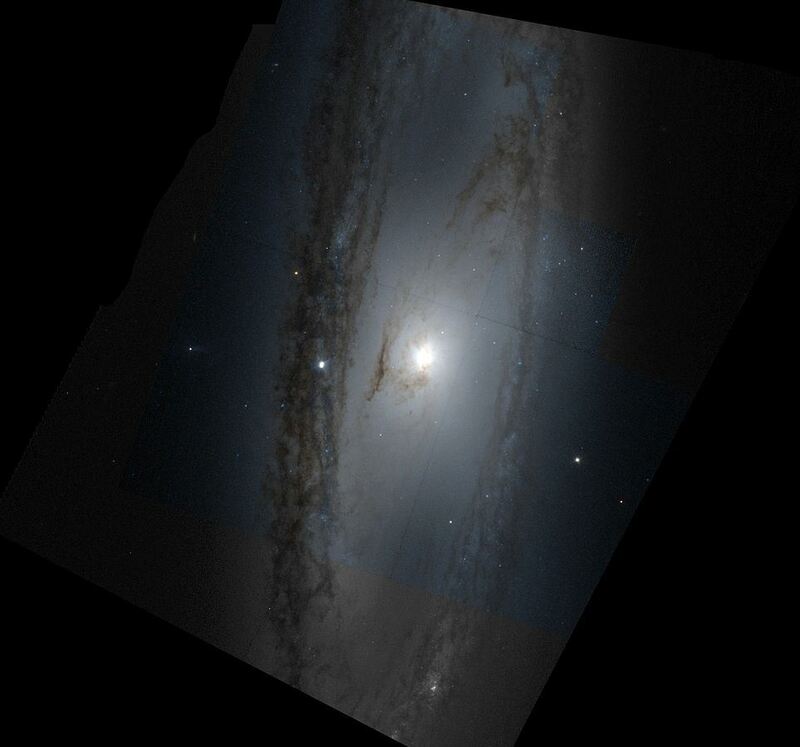 Larger telescopes reveal the dark dust lanes and other details of M65. 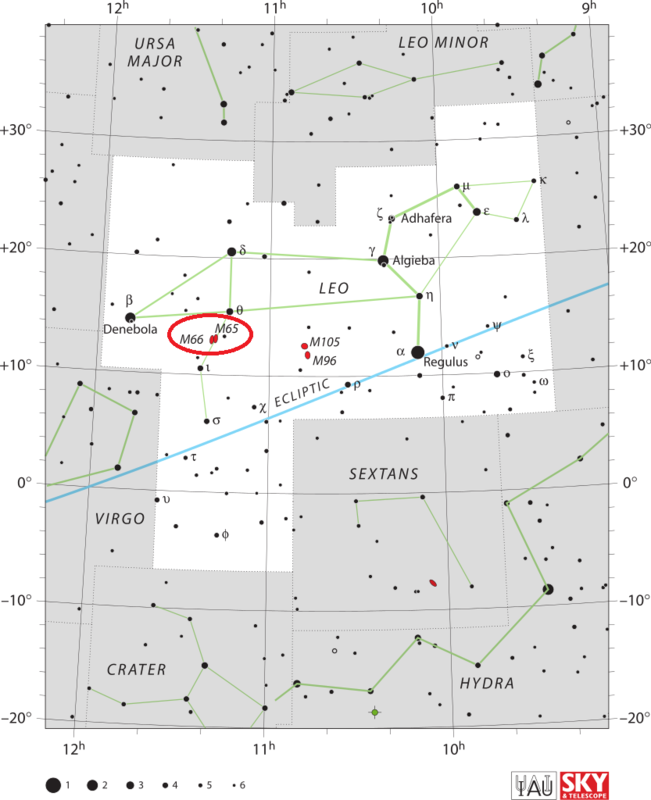 Messier 65 can be found along the line from Denebola to Regulus. The galaxy lies right between the stars Iota Leonis and Chertan, Theta Leonis. It can be found only 3 degrees from Chertan. The best time of year to observe M65 is during the spring. The Leo Triplet, also known as the M66 Group, is a small grouping of galaxies that are known to be gravitationally interacting with each other. The interaction has affected all three galaxies, but M65 is the least affected of the group. With tightly wound spiral arms, a conspicuous central lense and a dust lane along the facing edge, M65 appears like a normal spiral galaxy. It is moving away from us at a velocity of about 807 km/s. Messier 65 contains little dust and gas and, even though its spiral arms show some evidence of recent star forming activity, there is overall little star formation occurring in it and the ratio of old, evolved stars to young ones is quite high. The recent star formation and the galaxy’s disk, which appears slightly warped, both indicate that M65 is interacting with its large neighbours. The galaxy may also have a central bar, which may indicate tidal disruption, but it is difficult to confirm the existence of the bar because M65 is positioned at an oblique angle when seen from Earth. The 1st of March 1780 was a particularly productive night for Charles Messier. Combing the constellation of Leo for additions to his grand astronomical catalogue, he struck on not one, but two, new objects. One of those objects is seen here: Messier 65. “Nebula discovered in Leo: It is very faint and contains no star,” he jotted down in his notebook. But he was wrong — as we now know, Messier 65 is a spiral galaxy containing billions upon billions of stars. All Messier saw was a faint diffuse light, nothing like the fine detail here, so we can forgive his mistake. If he had had access to a telescope like Hubble, he could have spied these stunning, tightly wound purple spiral arms and dark dust lanes, encircling a bright centre crammed with stars. Messier 65 contains a radio source, located about 2 arc minutes from the galaxy’s core. The source has not yet been identified and its nature is uncertain. A single supernova was detected in the galaxy in 2013. SN 2013am was discovered 15.3 arc seconds east and 103.2 arc seconds south of the galaxy’s core on March 21 of that year. At the time of discovery, the supernova had a visual magnitude of 15.6. By April 17, it faded to magnitude 16.3. SN 2013am was classified as a Type II supernova. 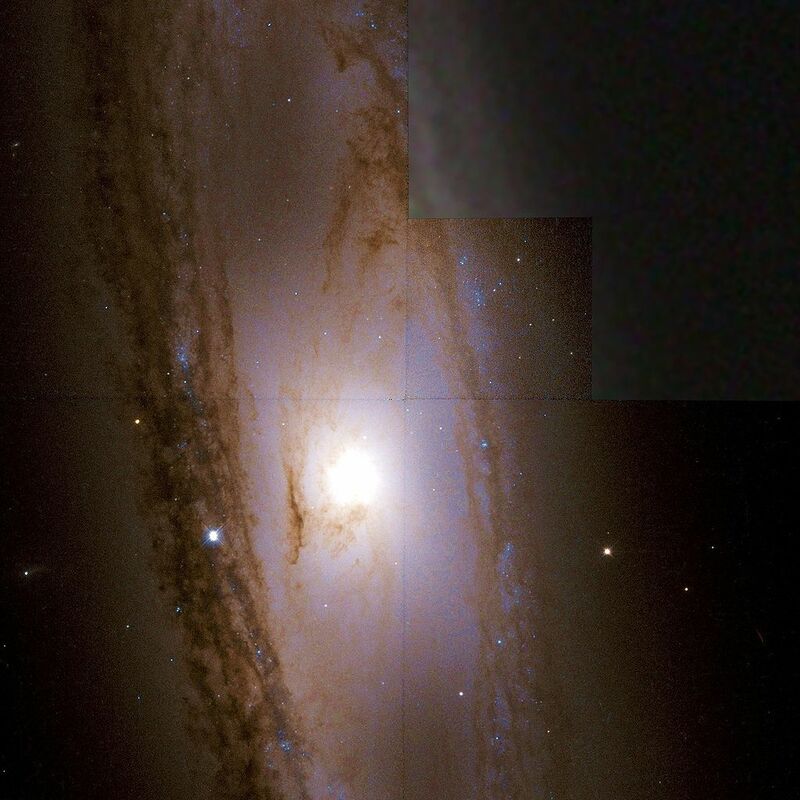 Messier 65 was discovered by Charles Messier, but William Herschel wrongly attributed the discovery to Messier’s friend Pierre Méchain in his work A Cycle of Celestial Objects and Kenneth Glyn Jones picked up the error in the 1960s. A number of sources now wrongly credit Méchain for the discovery even though Messier never acknowledged his colleague’s sighting. Halton Arp included M65 and its neighbours in his Atlas of Peculiar Galaxies as object number 317, denoting the Leo Triplet. Messier 65. Based on observations made with the NASA/ESA Hubble Space Telescope, and obtained from the Hubble Legacy Archive, which is a collaboration between the Space Telescope Science Institute (STScI/NASA), the Space Telescope European Coordinating Facility (ST-ECF/ESA) and the Canadian Astronomy Data Centre (CADC/NRC/CSA).